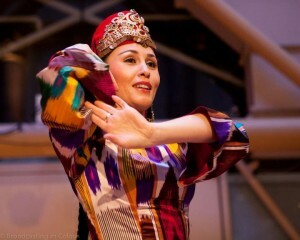 San’at was born in Uzbekistan, and performed since she was 2 years old. Her attraction and passion for dance flourished ever since. After years spent studying dance in Uzbekistan, she specialised in the dance of Uzbek and international folklore. She was introduced into a professional career as a dancer with the Shodlik Ensemble through an Honorary Artist of Uzbekistan, Kunduz Mirkarimova, and was coached by another Honorary Artist of Uzbekistan, Dilafruz Jabbarova. San’at has been a lead dancer for many leading dance troupes in Uzbekistan and has worked with internationally renowned performers such as Munojat Yolchieva, Sherali Juraev, Abduhoshim Ismoilov, Nasiba Sattarova, Yulduz Usmonova.